Last month news broke that video game giant Square Enix was bringing a brand new RPG exclusively to the iPhone, and that it was being developed by a team whose combined resumé consisted of work in both the Wild Arms and Final Fantasy series. Needless to say, expectations skyrocketed with such an announcement, and to top it off this ambitious project is based on an entirely new, unproven IP. 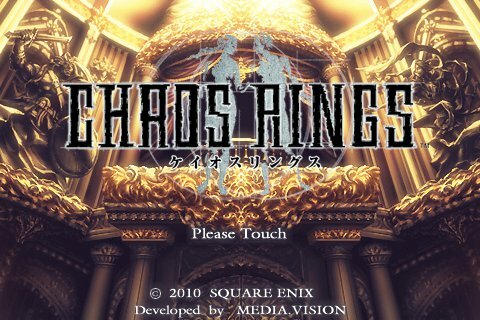 Now that Chaos Rings [App Store] is finally available, does it actually deliver? After putting the game through its paces, I can safely say it stands to not only meet any high expectations but exceed them in remarkable fashion. 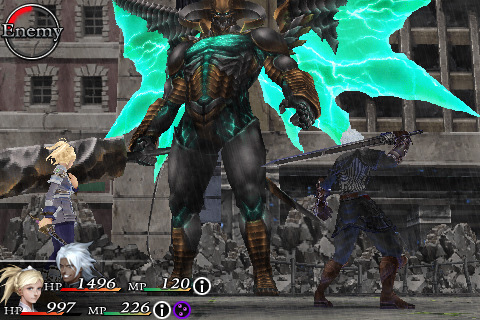 With stunning visuals and captivating gameplay that is tailored specifically for Apple’s device, Chaos Rings defines what an RPG experience should be like on a mobile platform. The story revolves around a dark tournament in a mysterious place known as the Arka Arena. Take control of one of four two-person teams as you advance through the arena’s enemy-laden dungeons, ultimately preparing to square off against the opposing teams themselves in a fight to the death. The last ones standing are promised eternal youth and immortality. The reason each combatant has been summoned to this tournament and exactly why they have been paired with their particular partner slowly unfold via text cutscenes as the game progresses. Each team has their own storyline to play through, and they all intertwine with one another in intriguing ways. It’s all very well written and remains interesting while still being suitable for on-the-go play, avoiding the problem of an overly convoluted story that is hard to follow in short bursts. The bulk of the game is spent traversing through the Arka Arena’s four distinct dungeon locations. Here you’ll engage enemies randomly in a combination of indoor and outdoor settings, and each dungeon has a mid-level and end-level boss encounter. The random fighting is broken up with an occasional logic puzzle that must be beaten to advance in the game by granting an item or access to a new area. The style of the puzzles varies based on which dungeon you’re in and what team you’re playing with. They’re a fun distraction, and force you to think hard while delivering a breather from the constant enemy confrontations. 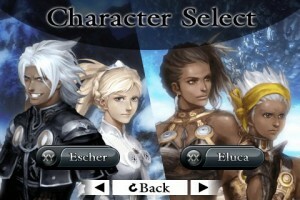 The battle system is turn-based and has you controlling both characters in your party with an easy to use touch menu interface. The two members of your team can either attack individually or pair-up for a combined strike. This collaborative effort can deliver a more devastating blow, but leaves your combatants vulnerable to being counter-attacked in tandem. There’s also a number of upgradeable magic abilities and weapons in the game that are obtained from defeated enemies, treasure chests, or the in-game shop. Control outside of battle is handled simply with an analog stick that appears anywhere the screen is touched, and one multi-use action button in the corner. 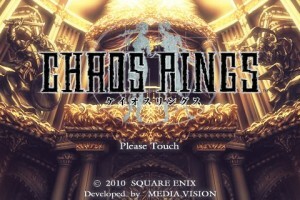 The structure of Chaos Rings is intelligently designed, and caters to a broad variety of players. Before entering a dungeon, you can choose the difficulty level of the enemies you face within. The higher the level you play on, the more treasure and rare items you will come across. A more casual gamer can choose to fight the easiest tier of enemies as they make their way through the story. In addition, you can toggle random enemy encounters on or off at any time for a more streamlined play experience. On the other hand, you can spend as much time on character leveling as you want. Any of the dungeons can be replayed at any time, so feel free to go back and endlessly grind your way to more powerful weapons and spells. It’s a smart, flexible system that allows you to choose how to tackle the different aspects of the game. It took about 8 hours to beat the game with my first team, and once finished you can start a new game using the same characters and retaining much of your equipment and experience from the previous playthrough. Coupled with three additional teams to play as, there is a mountain of content here that should last most players a long time. Graphically Chaos Rings really impresses. Beautifully illustrated 2D backgrounds make up the environments, while characters and monsters consist of detailed 3D models. It has a look that’s evocative of classic Playstation-era RPGs. The battle sequences are fully rendered in 3D and really showcase the gorgeous enemy designs and fluid animations. The huge bosses in particular are downright intimidating as they fill your touch screen with their presence. A dramatic soundtrack accompanies the action and provides a unique sound for each of the locations in the game. In the end, it’s not really about how Chaos Rings does anything especially new, but rather how it takes all the pieces of a traditional role-playing game and packages it together in a way that feels natural to the platform. The result is something more akin to an action-adventure game with heavy RPG elements. The turn-based fighting is gratifying and never got old, and the story and character development remains immersive even in short play sessions. The entire experience feels like a high quality console offering shrunk down to portable size. Chaos Rings is executed brilliantly on just about every level, and has all the makings of a true classic. The fact that it’s exclusively available for the iPhone makes a huge statement for the legitimacy of gaming on Apple’s device, and is hopefully a symbol of many great things to come in the future of App Store gaming. Next PostNext ‘Football Manager Handheld 2010’ — The definitive football management sim sizes up the App Store.